SPG and Emirates launched Your World Rewards program for reciprocal elite benefits and bonus Starpoints and Skywards miles few years back. 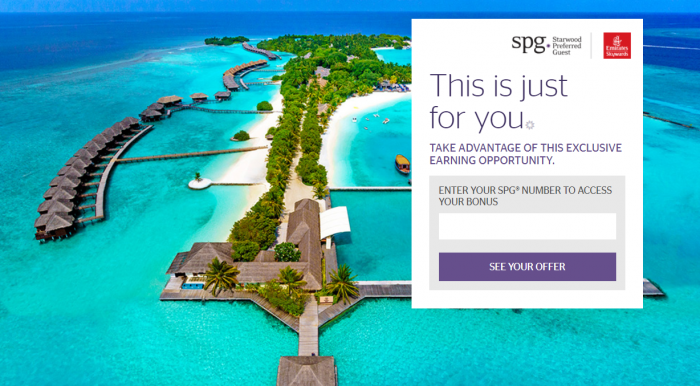 Now, SPG has launched targeted bonus Starpoints campaign for select members that have signed up for this program to drive them to stay more at Starwood properties by offering Starpoints as an incentive. Interesting that there is yet another targeted bonus Starpoints offer out there and this time for those that have linked their accounts with Emirates. I have linked SPG/Emirates but wasn’t eligible for this offer. My account was, however, eligible for the other targeted promotion which earning period started on September 15 (read more here).